Here is where children go on holiday! No time for boredom. 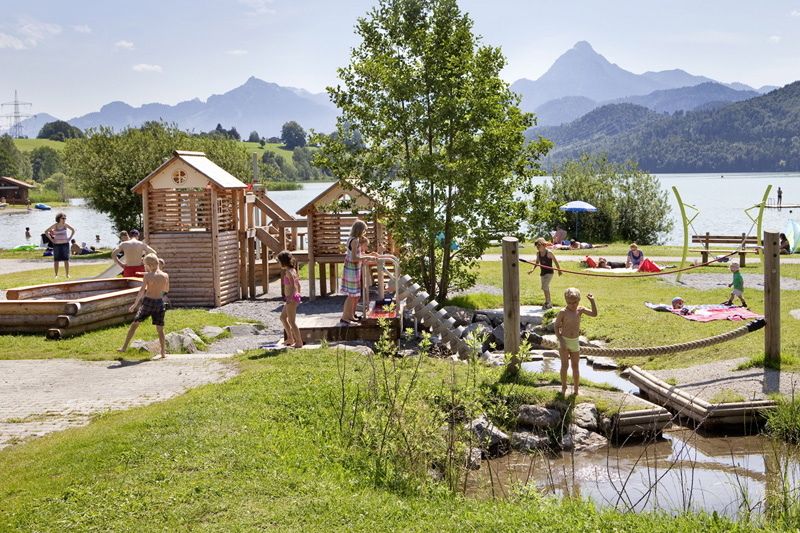 SEESPITZ is a holiday paradise for children – we offer all the fun our youngest guests could wish for. There is always an opportunity for an entertaining match, together with the family or even with other hotel guests: Table tennis, table football or pool can enliven a rainy day. And when the weather is sunny, the hotel lido offers an extensive and save playground with a many fun things to do. The kindergarten is free of charge for you. Our opening hours are from Monday to Friday from 08:00 am to 12:30 pm. Okay parents – time to head off for an extensive shopping session in the city of Füssen. SEESPITZ thinks about your needs! As an additional service, we also offer you children’s beds, high chairs, baby phones as well as useful children kits that you can borrow from us free of charge. We offer also free laundry: In particular, this service is sure to make families who have little ones very happy: In our hotel, we have high-quality washing-machines with tumble dryers that we place at your disposal free of charge. In the washing room, which is next to the underground car park entrance, you will also find an ironing board and iron.